Mauve (H2) flowers, VIII–X; pretty, grey-green foliage; height 10–15cm; spread 26–30cm. A slow-growing plant suitable for rockery or trough. Introduced in USA by 1962. ♤ Lilac buds, IX–XI; dark green foliage; upright like 'Amethyst'; height 50cm; spread 40cm after 5 years. Chance seedling, found by Johannes van Leuven in September 2002. Named after Daniela, a worker in van Leuven' s nursery . ® C.2005:05 registered on 23 December 2005 by Johannes van Leuven, Ilmenweg 39, D-47608 Geldern-Liillingen, Germany. Foliage dark green; habit small dwarf. The stems are erect, giving the plant a bun shape. It is a good plant for the sink garden. It was found c. 1985 by Ingvar Danielsson (hence the name) at Smedjebacken, Dalarna, Sweden. ♤ Pink buds, VIII–XII; dark green foliage; height 26–30cm; spread 31–45cm. The name is an anagram of the starting letters of the three words "dark", "pink" and "Alicia". Sport on 'Pink Alicia', found on 1 November 1999 at Kurt Kramer's nursery. Name is an anagram of the initial letters of the three words Dark, Pink, and Alicia. ♤ Large white buds, VIII–XII; dark green foliage; compact upright habit; height 26–30cm; spread 31–45cm. Sport on 'Babette', found on 1 November 1999 at Kurt Kramer's nursery. Semi-double deep cerise (H6) flowers deepening to ruby (H5), VIII–X; dark green foliage; compact; height 21–25cm; spread 31–45cm. One of the best lings introduced in the late 1900s, gaining a Gold Medal in Boskoop, Holland, in 1990. ♤ Bud-flowering, dark pink (H7), bud small; IX-XII; foliage dark green; habit upright, broad; height 50cm; spread 50cm after 4 years. Sport on ‘Moulin Rouge’ found by J. van Leuven in October 2006. ® C.2011:16 registered on 25 November 2011 by J. van Leuven, Geldern-Lüllingen, Germany. Semi-double crimson (H13) flowers, VIII–X; dark green foliage; neat, compact habit; height 16–20cm; spread 31–45cm. Much more showy than 'Darkness', with brighter, redder flowers, but not as red as 'Dark Beauty'. Sport on 'Darkness'; found by Ernst Stührenberg (Wiesmoor, Germany) in 1981; introduced in 1984. Name probably a reference to its parent, and perhaps to flower shape. Masses of crimson (H13) flowers, VIII–X; dark green foliage; neat, compact, upright habit; height 21–25cm; spread 31–45cm. Outstanding. Seedling; raised before 1966 at the University of Liverpool Botanic Gardens, Ness, The Wirral, Cheshire, England, by M. C. ("Denny") Pratt; introduced by University of Liverpool Botanic Garden. Name is a pun on Ness, where it originated, and the dark flower colour. Lilac-pink (H11) flowers in curly headed spikes, VIII–X; purple-green foliage; compact habit; height 31–45cm; spread 31–45cm. Found in Scotland by 1926; introduced by James Smith (Darley Dale, Derbyshire, England) in 1926, and then incorrecly labelled 'Tenuis'. Numerous amethyst (H1) flowers, VIII–X; dark green foliage; compact; height 26–30cm; spread 31–45cm. The "Dart's" series of heathers was introduced by Darthuizer Nurseries (Leersum, Netherlands) between 1972 and 1982. Seedling; found at Darthuizer Boomkwekerijen (Leersum, Netherlands); introduced by Darthuizer Boomkwekerijen in 1976. Named from Darthuizer Boomkwekerijen have names beginning with Dart's; flower colour. Pale purple (H10) flowers, VIII–IX; soft bronze-green foliage; height 21–25cm; spread 31–45cm. Lilac-pink (H11) flowers, VII–VIII; dark green foliage; vigorous, upright, rather open; height 46–60cm; spread 61–75cm. Mauve (H2) flowers, VII–IX; bronze-yellow foliage turning red in spring; spreading, creeping habit; height 10–15cm; spread 46–60cm. Seedling; found at Darthuizer Boomkwekerijen (Leersum, Netherland) in 1973; introduced by Darthuizer Boomkwekerijen in 1976. Plants from Darthuizer Boomkwekerijen have names beginning with Dart's. White flowers, VIII–IX; bright yellow foliage throughout the year; height 10–15cm; spread 31–45cm. A sport from 'Ruth Sparkes', but more compact and lower growing and less susceptible to reverting to green foliage. Plants from Darthuizer Boomkwekerijen have names beginning with Dart's; foliage colour. Mauve (H2) flowers, VIII–IX; lime-green foliage in summer, going orange in winter; spreading growth; height 16–20cm; spread 31–45cm. Sparse white flowers, VIII–IX; green-gold foliage; arching stems; spreading; height 16–20cm; spread 31–45cm. White flowers, VIII–IX; yellow-green foliage, turning more yellow in winter; height 31–45cm; spread 46–60cm. Introduced by Darthuizer Boomkwekerijen (Leersum, Netherlands) by 1976. Plants from Darthuizer Boomkwekerijen have names beginning with Dart's; the reason for parrot is not known. Mauve (H2) flowers, VIII–IX; grey-green, velvety foliage; vigorous, upright; height 31–45cm; spread 61–75cm. Seedling found at Darthuizer Boomkwekerijen (Leersum, Netherlands); introduced by Darthuizer Boomkwekerijen in 1973. Plants from Darthuizer Boomkwekerijen have names beginning with Dart's; silver and rocket refer to the colour and habit of the foliage. Mauve (H2) flowers, VIII–IX; grey-green foliage, young shoots tipped red in spring; open, upright habit; height 31–45cm; spread 46–60cm. ♤ Mauve (H2) buds, VIII–XI; dark green foliage; height 16–20cm; spread 31–45cm. Wild-collected sport; found on the moors beside Broadstone Golf Links, Dorset, England, by C. D. Eason of Maxwell & Beale; introduced by Maxwell & Beale (Broadstone, Dorset) in 1935. Named after Charles Eason's son (see under Erica cinerea 'C. D. Eason') (Yearbook of the Heather Society 4 (1): 32-34 (1993)). Purplish pink flowers, VIII–X; yellow foliage throughout the year, particularly bright in spring; broad upright habit; height 46–60cm; spread 61–75cm. Sport on 'Hollandia'; found in 1988, and introduced by C. Hagenaars (Breda, Netherlands) by 1990. Mauve (H2) flowers, VIII–IX; pale orange foliage in summer, changing to red in winter; dense upright habit; height 31–45cm; spread 31–45cm. Wild-collected; found at the Bridge of Orchy, Argyllshire, Scotland, in 1963; introduced by David Hutton (Aberfoyle, near Callander, Perthshire, Scotland) by 1973. Some plants sold under this name are believed to be 'Multicolor'. Named after the nurseryman but not named by himself. Semi-double white flowers, VIII–X; yellow foliage throughout the year; height 26–30cm; spread 31–45cm. Foliage lime-green with copper tips in Spring. A selection made by J. Hachmann (Barmstedt, Schleswig-Holstein, Germany) by 2000. Crimson (H13) flowers, VIII–IX; dark green foliage, flecked with red and yellow; broad, erect habit; height 21–25cm; spread 31–45cm. Amethyst flowers, VIII–IX; green-yellow foliage, tinged red in winter; broad, spreading habit; height 26–30cm; spread 31–45cm. Found by T. Huisman (Hattem, Gelderland, Netherlands) by 1980 and named after T. Huisman's daughter. ❁ Deep pink flowers, VII–X; dark green foliage; open, spreading habit; height 16–20cm; spread 31–45cm. Named after the eldest daughter of the introducer, David Wilson (British Columbia, Canada). White flowers, VIII–IX; yellow foliage throughout the year; height 21–25cm; spread 31–45cm. Sport on 'Loch Turret'; found by R. J. Brien (Pitcairngreen Heather Farm, Perth, Scotland) in 1981. Named after Lady Diana Spencer (Princess of Wales) on occasion of her wedding to the Prince of Wales. Pink (H8) flowers, VIII–IX; dark green foliage, flecked with cream in spring and summer lasting longer than most spring tip cultivars; spreading habit; height 21–25cm; spread 31–45cm. Lilac-pink (H11) flowers, VIII–X; dark green foliage; dense spreading habit; height 10–15cm; spread 31–45cm. 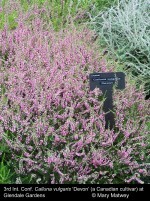 Sport on 'Mrs Ronald Gray'; found by H. J. Weber at Driebergen Heather Garden, Netherlands, before 1972. Named after the daughter of the finder. Red flowers; IX-XII; foliage green; habit upright; height 35cms, spread 45cms. Sport on 'Dark Star' . submitted for plant breeders' rights in Germany by J. Brandt (Prisdorf, Germany) on 4 August 1999. White flowers, VIII–IX; bright green foliage; vigorous habit so requiring severe pruning; height 31–45cm; spread 46–60cm. Found by Mrs Rushworth (Haworth, Keighley, Yorkshire, England) before 1969; growing at Harlow Carr between 1969 and 1974. ♤ Bud-bloomer, calyx lilac (H3);IX-XI; foliage mid-green; habit broad, bushy. Deliberately bred seedling; raised by K. Kramer in 1991 (sister-seedling of 'Fritz Kircher'). The name comprises the German words for three (drei), zero (null) and four (vier) (304 was its nursery code). Registered on 3 November 2002 by Kurt Kramer. White flowers, abundant in spikes of varying length, VIII–IX; light green foliage; erect habit; height 16–20cm; spread 46–60cm. Named after a small area in the Cairngorm mountains, Scotland. White flowers, VIII–IX; pale green foliage; open, upright habit; height 45cm; spread 55cm. Named after a town in Perthshire, Scotland. ♤ White buds, IX–XI; yellow foliage turning yellow-brown in winter; broad upright habit; height 31–45cm; spread 31–45cm. Sport on 'Sandy', found on 28 September 2001 by Fa. Holz. CQ Ericultura 130: 26 (2003). Named by Kurt Kramer. Lilac-pink (H11) flowers, VIII–IX; lime-green foliage in summer, with orange tips in winter, deepening to red in colder environments; height 10–15cm; spread 31–45cm. It is particularly effective in continental climates. Wild-collected; found near Dunnet Head, Caithness, Scotland by David McClintock (Platt, Kent, England) in 1972; introduced by P. G. Zwijnenburg in 1976. Large, densely packed, lilac-pink (H11) flowers, VIII–X; dark green foliage; upright habit; height 31–45cm; spread 46–60cm. Named after the cottage of the finder. ♤ Deep mauve (H2) buds, IX–XII; dark green foliage; height 26–30cm; spread 46–60cm. An attractive plant. Introduced by Mr & Mrs Ray Warner (Barncroft Nurseries, Longsdon, Stoke-on-Trent, Staffordshire, England) before 1977. Name of a neighbouring hamlet and the name of the road on which the nursery is situated. Rarely produces pink (H8) flowers, XI–XII; attractive purple-green foliage with a misty appearance; height 26–30cm; spread 75–100cm. Named after a wood north of Petersfield, West Sussex, where it was found. Long stems of clear amethyst (H1) flowers, VIII–IX; dark green foliage; erect; height 46–60cm; spread 46–60cm. Found by H. A. Verheul and named after the town in the Netherlands where it originated.